Coming up with date ideas that do not involve dinner is pretty difficult when you live in Chicago—home to restaurants like Lula, Longman & Eagle, and Avec, whose names alone can induce dreams of date night decadence. To get your creative planning juices flowing, we rounded up five fun activities to inspire the romantic in you while helping you break free of the predictable dinner/ drinks routine. Read on for our couple-inspired ideas, and decide how you and your boo will make this Valentine's Day the least-predictable one yet. No calories included! 1. Take A Photo Booth Tour Of The City. Grab your partner in crime and hit up as many of our city’s 30+ photobooths to take a series of snaps that commemorate the day. Plan out a cute narrative or be spontaneous and see what develops. Check out this handy photo booth locator, plot your destinations, and go! 2. Create Personal Scents At Aroma Workshop. What’s more intimate than a scent? It’s those crazy pheromones of yours that got you and your honey together in the first place. Explore those stimulating fragrances and learn about your significant other as you craft custom scents together at Aroma Workshop. Aroma Workshop, 2050 North Halsted (at Dickens Avenue); 773-871-1985. 3. Get Your Auras Read At The Ruby Room. You and your partner may know each other pretty well but do you know what each others’ auras look like? Book an auratherapy session at the Ruby Room and find out! Their special aura imaging machine can capture the size, shape, and color of your aura and chakras. They’ll even snap a photo of it and print it out for you! While you’re there, add on a Reiki session with Melanie and ensure that your sacral chakra is in perfect working order. Ruby Room, 1743-45 West Division Street (at Hermitage Avenue); 773-235-2323. 4. Chicago Reader’s Anti-Valentine’s Day Party. Sometimes the worst dates turn into the best stories. The Chicago Reader’s annual Anti-Valentine’s Day Party is proof of that. Spend the night listening to others share their hilariously cringe-worthy romantic horror stories while you sip complimentary champagne and thank the universe that you’re not playing the field! Logan Square Auditorium, 2539 North Kedzie Boulevard (at Linden Place); 773-252-6179. 5. Play Hookie, Old Chicago Style. Take a cue from the Chicago classics. Call in sick and do all the touristy things you never have time for with your other half. Get brunch on a Tuesday (day drinking, anyone? ), take a trip to the museum, visit the Garfield Park Conservatory, go ice skating at the top of the Hancock building, take cheesy photos together at the Bean, and end the night with fancy cocktails at the Drake. 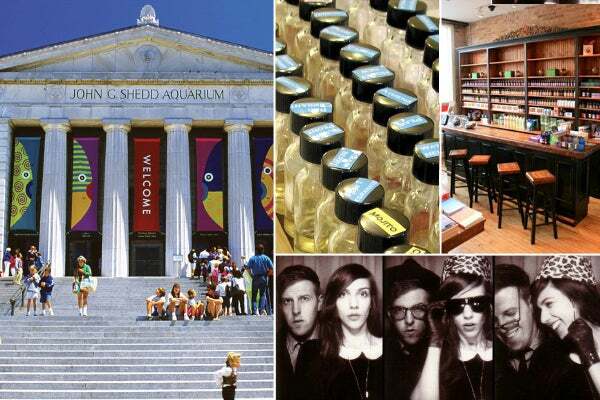 Photo: Via The Shedd Aquarium/ Courtesy of Ruby Room and Aroma Workshop. Photobooth images photographed by Leslie Bembinster and Christopher Hainey.